Brett Luke | The Journal Gazette U.S. Sen. Joe Donnelly, D-Ind., speaks to military veterans Saturday afternoon at HT2 off Scott Road. 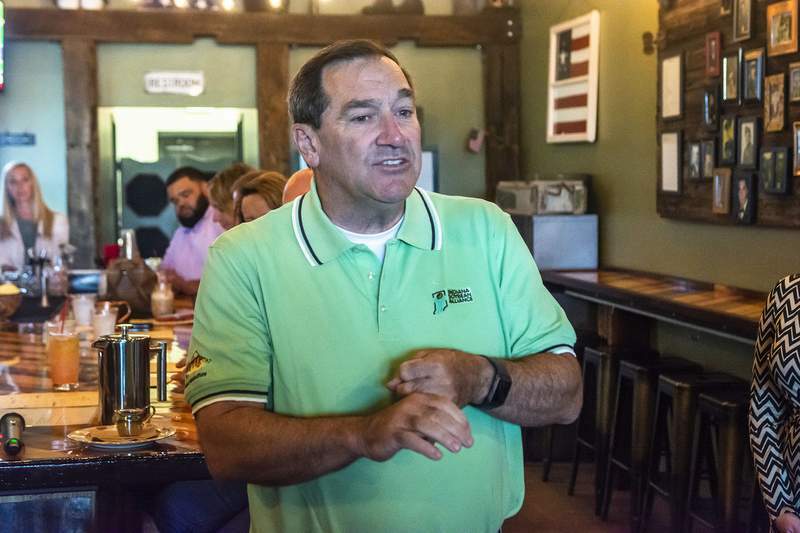 Democratic U.S. Sen. Joe Donnelly saw Saturday what he needs to see a lot more of come Nov. 6 – Republican support. Two people identifying themselves as longtime Republicans lauded Donnelly for his work for military veterans and their families during his campaign appearance at a Fort Wayne bar and restaurant. “Throughout Joe's time in the House and Senate, no priority has been higher to him than our veterans, making sure they get the care and recognition they deserve for their sacrifices to our great country,” James Garigen, founder of Invisible Vets, an advocacy group for homeless veterans, said at the military-themed HT2 off Scott Road. Garigen said he has been a “card-carrying Republican my entire voting life” but backs Donnelly. “I'm a card-carrying Republican of 30 years until Joe Donnelly,” veterans advocate Stephanie MacKenzie said. The widow of a veteran, MacKenzie said Donnelly and his staff helped her discover a life insurance policy she didn't know her husband had. The first-term senator is being challenged in the November general election by Republican Mike Braun, a staunch supporter of President Donald Trump in a state Trump won by 19 percentage points in the 2016 election. An NBC News/Marist poll released last week showed Donnelly leading Braun by 3 percentage points among likely voters. “I'm with the president when he's right, and when he's not, I try to tell him an idea that I think makes better sense,” Donnelly told reporters outside HT2. Granger resident Donnelly was among three Democratic senators – all of them up for re-election this year in states carried by Trump – who voted last year to confirm the president's first Supreme Court nominee, Neil Gorsuch. In Fort Wayne, Donnelly said he likely will announce how he will vote on Kavanaugh in coming weeks. The Republican-controlled Senate is expected to take its confirmation vote before Oct. 1. Donnelly told reporters he is reviewing Kavanaugh's testimony before the Senate Judiciary Committee last week and wants to be sure that Kavanaugh “would be strong on precedent” and “would stand up to protect health care” provided through the federal Affordable Care Act and Medicaid expansion. Donnelly said he reminded Kavanaugh of their Jesuit motto “Men for others” when the two Catholics talked in August. Donnelly earlier spoke to two-dozen people, many of them veterans, inside HT2, which stands for Hotel Tango 2. Donnelly listed several legislative measures he has pushed to benefit veterans and the military, including suicide prevention programs, yearly mental health assessments, the designation of March 29 as National Vietnam War Veterans Day and the National Defense Authorization Act. “The bulwark of our nation, the basis of our nation, is to make sure we stand with our veterans because you were there when liberty was in peril,” he told the gathering. Donnelly said that as a member of the Senate Armed Services Committee, “my job is to ensure that you are never, ever, ever in a fair fight – that all the odds are on your side” in the form of superior weaponry and equipment.